This page provides information on clinical psychology online and on campus programs. It tackles the questions – “what is clinical psychology” and” how is it different to counseling psychology?” and provides advice on programs to take in order to qualify in this field. Clinical psychology is the analysis, research and treatment of severe mental health disorders, such as bipolar disorder and schizophrenia. This can be contrasted with counseling psychology, which deals with everyday stresses, including career planning, learning difficulties, marriage guidance and family difficulties. This page has links to schools that are mainly for students who wish to study online. Click here to find out more about general psychology. 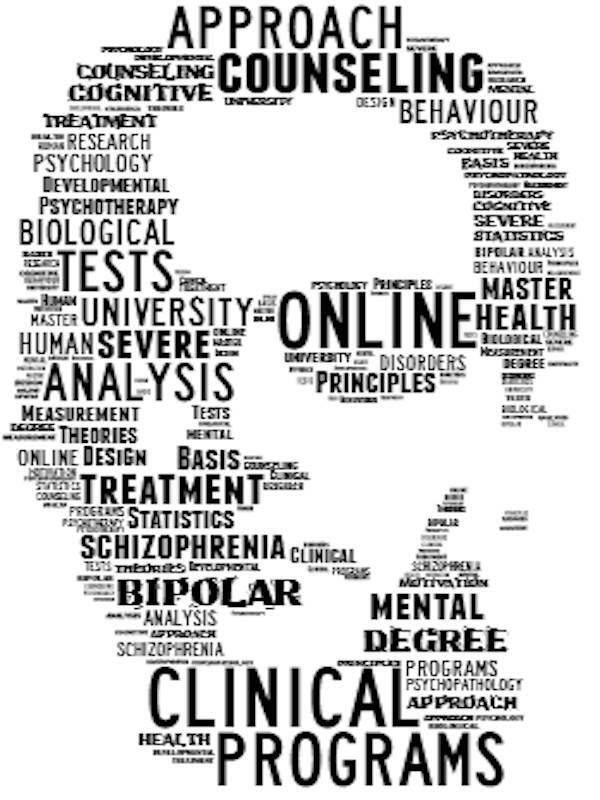 What do you study in clinical psychology online programs? Clinical psychology began in 1896 with the work of Lightner Witmer on learning disabilities. Witner established a clinic where learning disorders and other educational difficulties could be assessed and treated. Other psychologists followed with their own theories and treatments of educational and other psychological disturbances, e.g., Sigmund Freud, Carl Jung and Alfred Adler. There are now many theories and approaches to clinical psychology, and degree programs may vary slightly as to the content and specializations offered, depending on the research interests of the faculty. A thesis may be required in addition or in place of some of the courses. With a masters in clinical psychology (MA), you can become a guidance counselor, educator, clinical psychologist, social worker, research psychologist and more. With a suitable bachelors degree, but without a masters or a PhD, you would be qualified to work as a clinical psychology assistant. But for the best jobs you really need a PsyD or PhD. Salaries are high for top jobs clinical psychology. To a great extent your salary depends on your specialization in your clinical doctorate. In the US, the average salary in forensic clinical psychology is about US$71,000 (PayScales.com).